American Red Cross Disaster Action Team Leader and Disaster Mental Health Specialist Danelle Stoppel is always on the short list of those to be sent to assist with national Red Cross responses. She’s referred to around our chapter as “Deployment Danelle.” She recently deployed to New York to assist with the Sandy response by providing essential mental health services to folks dealing with the aftermath of the superstorm. Below is a compilation of messages and photos Danelle texted to our Director of Communications. It will be updated periodically until her return. Arrived at Manhattan (Greater New York) Chapter Headquarters. It was wonderful to meet up with people I have worked with on other DRs (Disaster Responses). I have been assigned to the borough of Queens which includes several hard-hit areas. I will be meeting with my team tonight and tomorrow we have been assigned to the bulk distribution sites throughout our area. The atmosphere at Headquarters was upbeat, but for those who have been here for several weeks report they are exhausted and due to very low drives to and from work sites and desperate conditions in the hard hit areas. June from Far Rockaway. she lost everything in her home to Sandy. All she really needs is a good pair of boots. Strong woman from Jamaica who made her home here 22 years ago. she loved to work with the elderly and is truly inspirational. Bulk distribution teams are now going door to door delivering clean up kits in Far Rockaway. We are working in teams with nurses as 1475 start coming in. Spontaneous volunteers with car loads of clothes, etc. 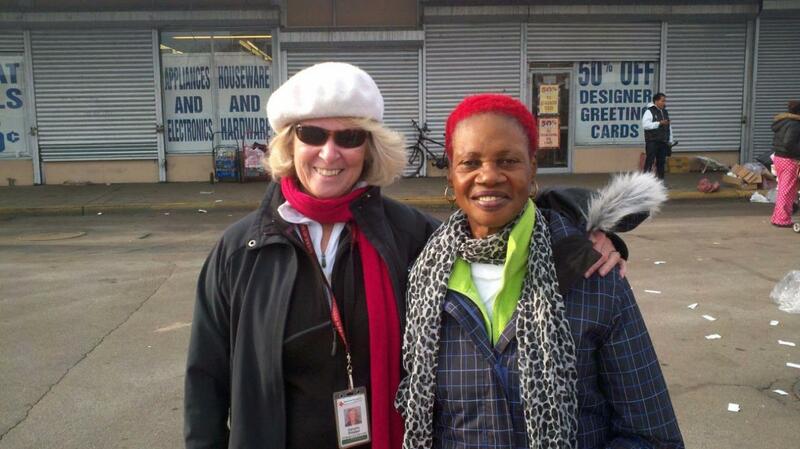 helping anyone in need in Far Rockaway. Door to door clean up kits are being delivered to Rockaway residents. I am now working with bulk distribution on a team with nurses and mental health specialists. I can’t talk about individual people, but it is very sad. People look like they have been in a war zone. I love being on the ground with real people. I miss everyon. 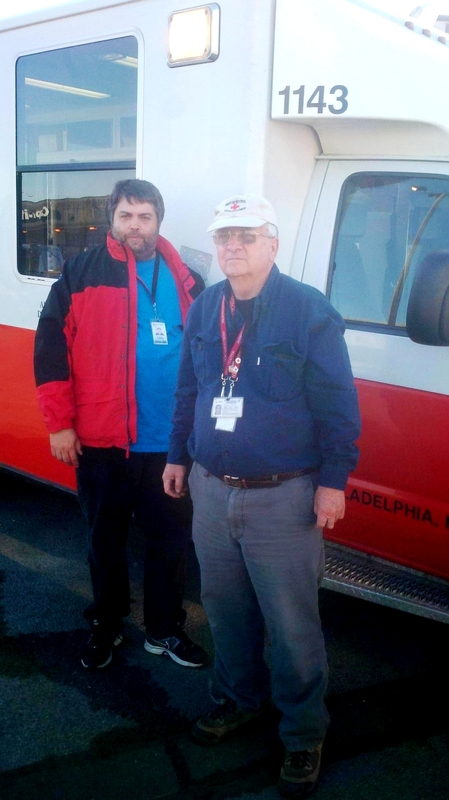 SEPA Volunteers Anthony and Ben with our ERV which have been serving meals and distributing items to those affected by Sandy in NY. Tomorrow, I return to the same distribution site. Due to the lack of housing options, we are staying in Manhattan, only 20 miles from the worst natural disaster to hit New York. Being downtown close to Times Square, it’s hard to imagine that such widespread disaster exists. the leadership in NYC has made it easier for the Red Cross to function. Our vehicles do not pay tolls and there is a facility where we can fill up our vehicles for no cost. Our hotel is parking our vehicles at no cost. The amount of people focused on this disaster is evident in all areas of the city. The respect for the American Red Cross is evident when you speak with people and so many people have gone out of their way to thank me. Saw Clifton (SEPA COO) this morning. He looked well rested and was attempting to control the crowd of people trying to out-process (leave the job). Today, I partnered with an international agency called Heart to Heart and delivered mental health services to their clients. Many did not speak English and I interpreted for them. This part of Queens is home to many nationalities and cultures. Many families from Guatemala, Mexico and Puerto Rico sought medical advice due to lack of electricity which destroyed their daily supply of insulin. I heard a very comment that no one could believe this could happen in New York. Many people stayed in their homes until the water reached their porch. Perhaps the most distressing aspect is the impact of Sandy on senior citizens here and in New Jersey. Losing their homes and all their belongings has impacted them physically, economically and emotionally. Yesterday was Thanksgiving, but not in Coney Island. Some areas have no stores open. The people depend heavily on the Red Cross for one meal a day. There are many people of Russian descent who do not speak English. legs and his left hand. Despite his physical limitations, he works as a lawyer in Manhattan. He lives on the fourth floor, and when the storm hit he was unable to leave his bed due to the loss of electricity. He was eventually hospitalized five days later due to hypothermia. He has returned home, but cannot function due to the loss of his van, which was lost to salt water erosion. from their small neighborhood. They are seniors who are living independently with staff who assist them to remain independent. They are now living in a shelter in another building. They have no hot meals since they normally cook for themselves. While they are being assisted by personnel they know, they are crowded together in a strange part of New York where they know no one. We will be returning to assist them with the ongoing stress associated with the loss of their privacy and their community on Coney Island. Hey, look who I ran into at 7:30…SEPA is in the house. Noel and his team. Two days on this disaster response and Noel has again become the GO TO MAN. Philly is making a difference…..lending our best to Manhattan. Bryan showed up at our outreach in site in Broad Channel. Great seeing Bryan! For the past several days, I have been on an outreach team. We are returning to places we know very well. This time we are armed with supplies, water, food, clothing, batteries, cleaning kits and winter coats. Disaster victims needs are endless and after one month, they are tired, cold,frustrated and desperate. People living on the outer islands are now experiencing very cold weather. This team concept is an effort to find people whose needs have notbeen met. Often, these people have lost everything. Housing shortage appears to be the greatest need. People from Coney Island are now living in hotels in Manhattan. Parents are driving their children back to Coney Island, Rockaway and Far Rockaway daily to attend their neighborhood school, which is open. Hotels cannot handle all of these people since the holiday season is coming. Today is the last day I will be on a team visiting families who lost a loved one in Hurricane Sandy. I have had a great deal of experience in the last year on these teams. I am always humbled to meet families and hear their stories. It requires one to hold back on emotions in order to get the job done. When we give the family the donation from the Red Cross we say, “This is from the American people.” This is why I volunteer for the American Red Cross. I will be back in Philly tomorrow and my Southeastern Pennsylvania Red Cross family will surround me and I will be grateful that I represented them here in New York.